Come for a romantic walk at Praia dos Ossos and capture the picture perfect sunset. Praia dos Ossos is very easy to locate. Near downtown Buzios, most visitors can walk to this beach from their hotels. It might be difficult to see at first as trees and private homes front the beach. While no one is quite sure how Praia dos Ossos, Beach of the Bones got its name, there are two possible stories. 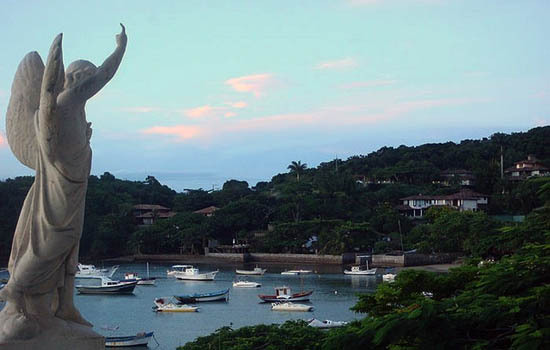 Whale hunting activities took place in Buzios until 1768. This beach was used for processing the whales after they were slaughtered. The oil was extracted and the whalebones were left on the beach. The second possible reason for the beach’s name goes back to the Tamoio Indians. The Tamoio befriended French merchants and pirates who came to Buzios to harvest the Brazilwood. The Portuguese wanted to stop this activity and ambushed the Tamoio Indians on this beach. Thanks to the overhanging trees that front Praia dos Ossos there is a bit of shade for those who do not like to bake in the sun. The still waters reflect the colored fishing boats that bob on the surface. There are also impressive yachts anchored a bit further out in the water. Because of the boats moored here there is not a lot of swimming. From this beach visitors can catch water taxis that will travel to other beaches in the area. Stay through sunset, as the colors are quite breathtaking. The cobblestone street that runs in front of the beach leads to a kiosk that used to be a boat hull. Here you can get snacks and drinks. Just down the way is the Igreja de Sant’Ana church, the oldest in the area. Stop by prior to sunset so you can tour the inside of the ancient church. With the Ipe trees proving shade and the private homes acting as sentries, Praia dos Ossos is quite captivating and very romantic. Praia dos Ossos is best visited in late afternoon. Take the time to visit the church and then walk back toward the beach, sit on the sand and watch the sunset. For a very romantic evening bring a bottle of wine and a picnic dinner. With 1,000,000 square meters and just 10 minutes from the center of Buzios, Buzios Golf Club is the best choice if you want to relax playing golf with the Atlantic Forest as the background.